SCHRAEMBL - Generalkarte von Nord America samt den Westindischen Inseln . . .
SCHRAEMBL, F.A. / POWNALL, Thomas. - Generalkarte von Nord America samt den Westindischen Inseln . . .
Generalkarte von Nord America samt den Westindischen Inseln . . . - SCHRAEMBL, F.A. / POWNALL, Thomas. 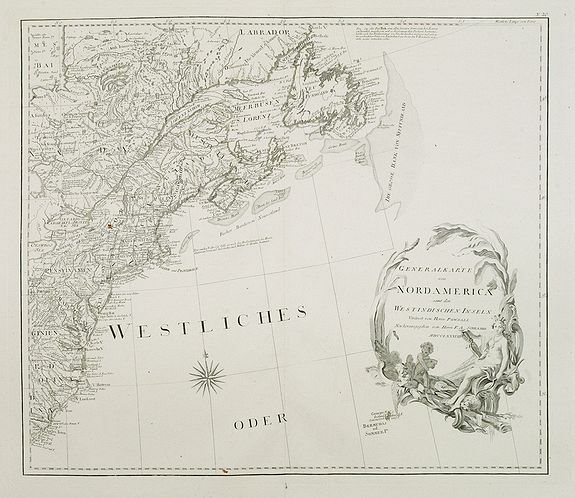 Title : Generalkarte von Nord America samt den Westindischen Inseln . . ..
Map maker : SCHRAEMBL, F.A. / POWNALL, Thomas.. Size : 19.7 x 22.8 inches. / 50.0 x 58.0 cm. Description :Map of the North American coastal states from New Scotland to Pennsylvania. Sheet 20 of Schraembl's "Allgemeiner Grosser Atlas", this is one of the first maps issued to depict North America following the American Revolutionary War. While this map has been updated to reflect the surveys prepared under Massachusetts governor Thomas Pownall, it is heavily based upon the important 1783 map of North America issued by Sayer and Bennet. The whole is beautifully rendered with wonderful detail regarding the early states, roads, canals, American Indian Nations, and explorer's observations. Vermont is not present on the map. The page features an elaborate title cartouche depicting a stylized American Indian woman and cherubs wrestling fish from the sea. McCorkle 788.6, Phillips (A) 694-36a-d, Stevens & Tree 49. Condition : Small spot on the left center. Ample margins, as issued. Dark impression. In good condition.